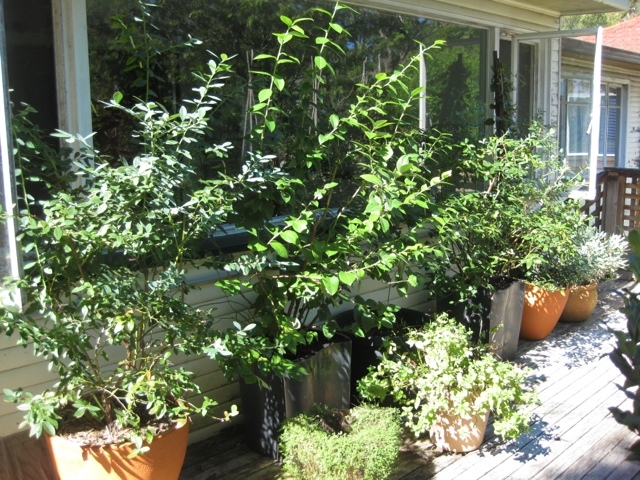 I have been thinking that my blueberry pots are getting a little to big on the deck and I am considering the garden. Of course all plants really grew in the ground long before pots were invented. The thing is my soil is remarkably sandy so I haven't wanted to pop them in without really working the soil. I did once have a blueberry in the ground but it just didn't do so well and they have been very successful in pots. Oh the decisions... Have you had success in the ground? Above is the location for the blueberries. 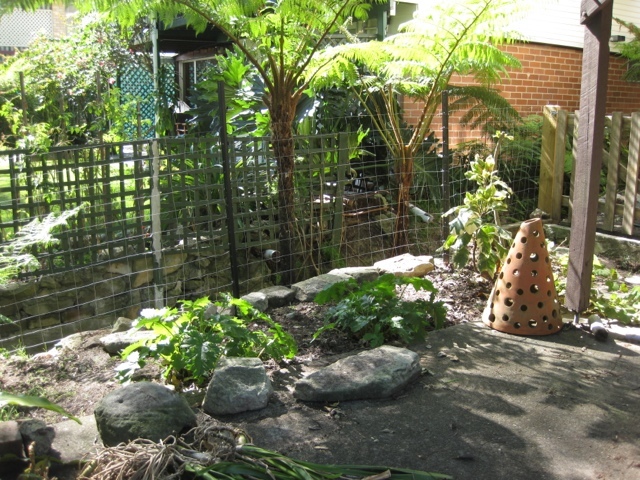 It almost faces north so it get reliable sun and the neighbour grows his vegetables on the other side of his fence. And now our fence has fallen down and been replaced by a wire one it should get more sun. Exciting news I found 3 cucumbers! It has been a long time between harvests. About 3 months since the last 3. Damn rats and heat have not been at all kind. But goodness me these were so crunchy and sweet well worth the wait. 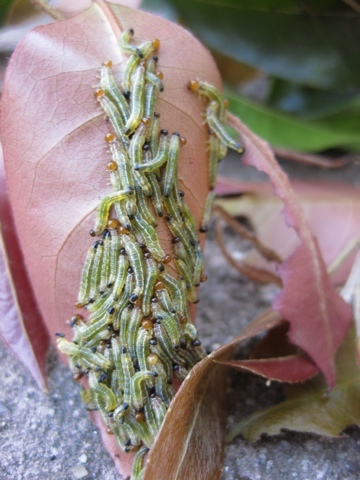 One last note I found masses and masses of callistemon saw fly caterpillar over my elaeocarpus edmundi. I sprayed it with rose shield after cutting most of them out. But I fear the worst and will have to keep an eye on them. Bugs are out to challenge me I am sure. How is your garden going? Autumn crocus doing it"s thing in the raspberry pot? So wondering how the vegetable garden is coming along? Pumpkins are flowering madly but are they forming fruit??? I know it's been a few weeks since I last wrote a zucchini post. 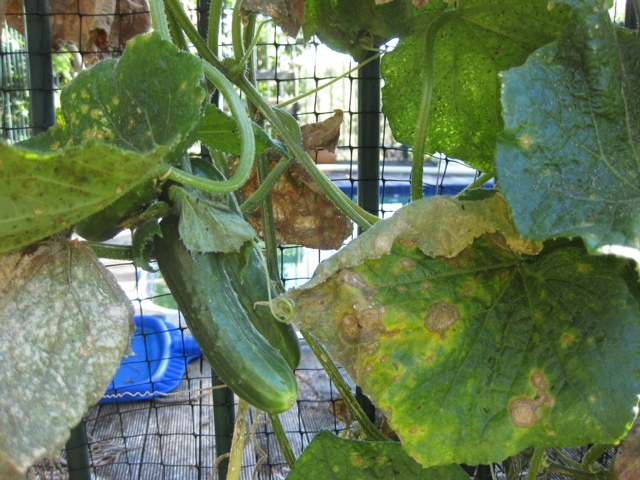 I have been sulking a bit because all my zucchini plants have died for one sad reason or another. I will have to plant them in a more sensible position next year and pray for no rodents. * Heat oil and add a finely chopped Onion, a couple of chopped garlic, a grated Carrot (which actually came from the garden) and a couple of grated zucchini. * Cook for a few minutes until they are tender. * In a food processor process a can of Chickpeas, a handful or 2 of breadcrumbs. Throw in the cooked veggies, an egg and season to taste. * Form into patties and roll in more breadcrumb. * Cook patties over a medium heat and turn carefully as you don't want to break them up. Then add a sliced tomato, beetroot, haluomi, homemade onion relish and avocado. It was quite a stack let me tell you! Can't wait for lunch tomorrow. So what amazing zucchini dishes have you been cooking lately? It was such a shock when your daughter Suellen called me to tell me the sad news about your fatal heart-attack. We had only been having a laugh together a week before. Today was the first time I have been back to your garden without you there. It would be nice to think you were perhaps just on a lovely holiday or spending time with your gorgeous family or friends I learned so much about over the past few years. The garden seemed quiet, well until I used the blower (Don, the neighbour didn't even complain). The Cassia (which we both know is a weed, but a gift from your mum so it is clipped after flowering to prevent seeds developing) is looking so pretty. I did lots of clipping, weeding, spraying, pruning, and blew the place clean just as you like it. I feel as if I didn't get to say goodbye properly. Thanks for being such a wonderful person and may the next part of your journey treat you well. Thanks for gifting me with my moonflower cactus I will think you each time it flowers. I shall carry on caring for the garden just as you like it until it becomes someone else's to care for. I sent a text message to a client the other day to ask if there was anything in particular he would like us to get on with when we got to his garden. 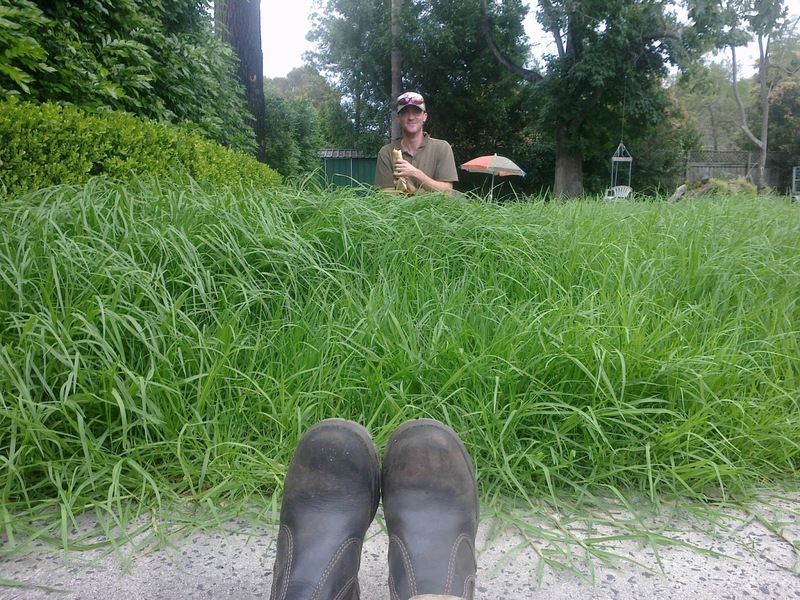 He responded "lawn is a little out of control as a result of lots of rain and sun". I figured it would be quite shaggy like most of my clients the gardens were finally putting on growth after such a lot and hot summer. 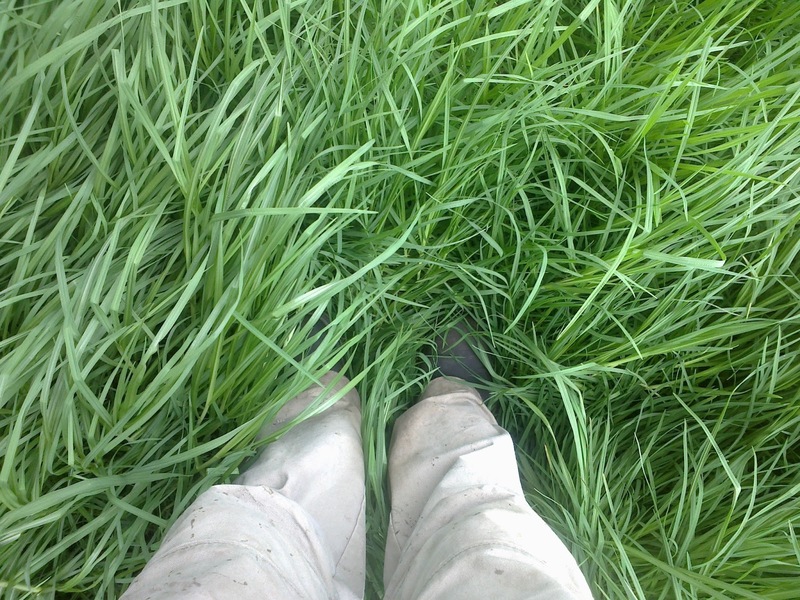 Why is it that grass grows so well right now but my tomatoes feel they don't have to put on much growth? How is your place growing? Do you have a section that you think I'll do it later and then realise you properly should have done it sooner? It's been a funny weekend. Lots of rain with a few brief moments where I could get out and do a bit in the garden. I have great plans but as I get wet enough while working I don't feel as if I have to do the same when it is for me. But I finally got around to doing a bit of a pot up which I am sure will make a lot of plants happy. I finally re-potted my Epiphyllum or Moonflower cactus that I have been waiting an absolute age to catch and grab a photo. I mostly forget to go out and take a picture and it seems to want to bloom on the nights it is raining! But tonight I braved the wet and snapped a couple of photos. I was luckily given a boysenberry plant from my dad's cousin. However she would like the pot back. So we drove it the 3 or so hrs up the coast in the car and left it on the drive to swap into another pot. After much pushing and poking it finally came out. Look what we found in the bottom of the pot (thanks Alison). I did have a small freak out. Mr R and V bravely put the funnel web into a container and took it to the hospital (where they can milk them to make anti-venom). It was quite a bumpy trip where V did mention that if the spider came out of the box then there would be no one driving the car as he would no longer be in it. Anyhow the chap behind the desk then started to shake the box about and declared it was actually a trapdoor spider rather than a funnel web. I believe the pokey bits out of it's tail are not long enough but it is indeed a female. Finally I have added these last 2 photos of an apple pie I made with cheddar cheese in the crust as I know my mum would like to see how it turned out. And to wish my Uncle Bob a happy birthday. Hope your weekend was adventure filled. It's the first of March today so in Sydney it is finally autumn. But I don't think I can talk about the new season without mentioning summer. This one was hot and came with natural disasters all over the country. While we escaped fire threats, devastating winds and flooding waters that many people up and down the coast suffered from we got our share of hot days, wet days and recently soul sapping humid weeks. But before I carry on complaining about the hot temperatures I think I have to remember what is great about summer. Long days, I love daylight saving we get an extra 3 hours of light at night in summer compared to winter. It always feels like you can get so much more done. Mind you the dog still seems to know that walk and food time should take place around 4-5pm regardless of light conditions. Jumping out of bed without the need of extra clothing to keep you warm. You don't have to do the shiver while getting dressed. In fact you rather wish you could carry out the work day in bare feet and shorts. Bare feet, swimming in cool waters, picnics without jumpers, early morning walks in the cool, cicadas, Christmas and New Year holidays, stone fruit, zucchini, chilli and basil. Tell me how was your summer?